Mahesh Babu is all set to resume the shoot of his 25th film Maharshi, which is directed by Vamsi Paidipally. The team wrapped up a schedule early this month in Pollachi in Tamil Nadu where the team shot few important sequences. Hearing that Mahesh Babu is in the vicinity, hundreds of fans gathered at the shooting spot to see the star. The bouncers had a tough time managing the crowd. Also, they had requested the fans not to capture any photos or visuals. However, it looks like the fans denied the request. 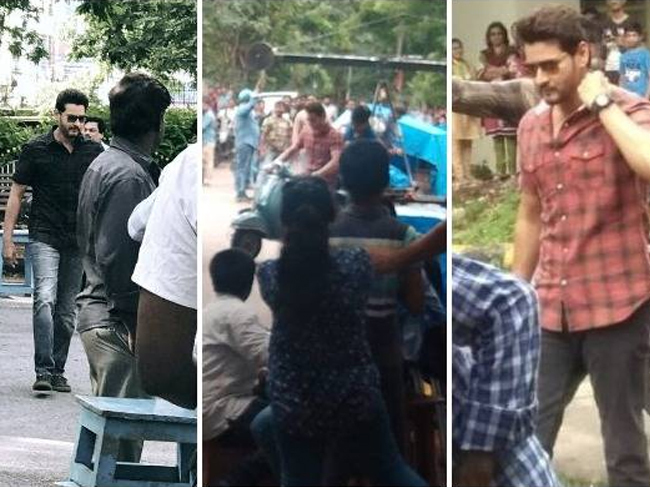 Yesterday, photos and videos from Maharshi spot has been leaked on the Internet, which is going viral on social media. We had earlier reported that Maharshi will also talk about the importance of the village, the people living there and their values. It says that Mahesh Babu will deliver a length talk about villages in the video. Looking at the photo, Mahesh Babu has been seen addressing the media near the paddy fields. It looks like the press meet scene will once again turn out a huge hit for the star.